Sykes, Sam. 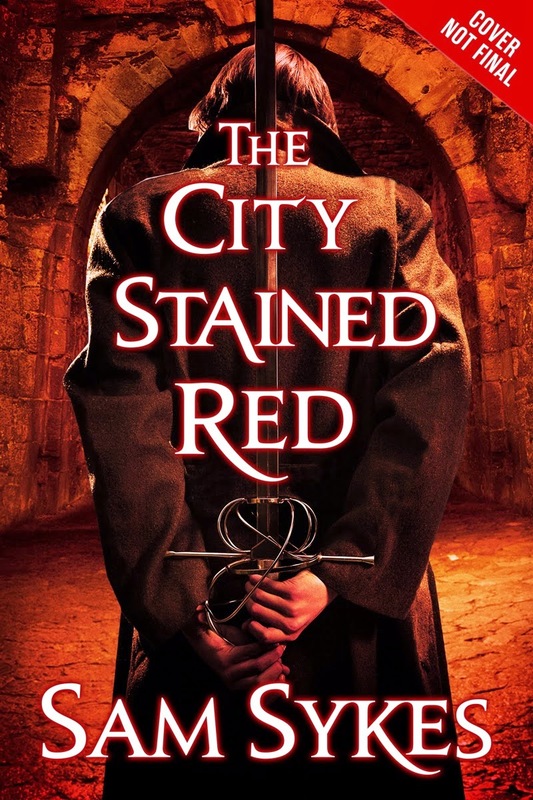 The City Stained Red. Orbit: 2014. Buy it (for quite a reasonable price, in fact!) here. It starts simply enough: the D&D-esque party of 'adventurers,' led by silver-haired (if not, sadly, silver-tongued) Lenk, arrives in The City. Their goal? To collect on some money owed them. The money is supposed to set them up for life, letting them settle in civilization and quit the adventurer life. The problem? Not all (or any?) of the others actually want to settle. They'd rather kill stuff, mostly. The goal of me reading this book? To be entertained—and I was. Sykes has a way with words, and sprinkles his prose with several laugh-out-loud moments in the dialogue (generally quite witty) and the description (hilarious and very vivid). The only real problem? It's two-fold. In the beginning, I couldn't understand why everyone seemed to hate poor Lenk the misunderstood fighter, even people who also claimed to love him, like those in the adventurer party (including the boy-wizard, the hulking dragonman (self-explanatory), the half-feral shict (mostly human-looking Cat Woman), the long-suffering priestess, and the world-weary thief) of which he was titular leader. But by the end, I couldn't understand why anyone would love him—in fact, I kind of hated Lenk too. Trouble is, I don't think Sykes intended to alienate the reader with Lenk's unlovability; he's not supposed to be an anti-hero, just a misunderstood hero with a heart of gold. Yet if, by the end, even the reader is half hoping the protagonist will, to quote Mystery Man, fall "down an elevator shaft—into some bullets," we've got a bit of a problem, either in the character himself, or in the execution. Sykes tackles real questions of contemporary social relevance, cloaked in the language of fantasy, and this aspect of the story was plenty interesting. Replace any of the fantasy-speak for the various species with words like "minority" and the human elite with "white people" and we can read all manner of racial and ethnic struggle into the various non-human characters' stories and actions, particularly that of the scene-stealer Gariath the Dragonman. Yet Lenk is supposed to be the likeable glue that holds this motley crue (haha) together, and instead, by the end I can't for the life of me imagine what any of his non-human companions, far more sympathetic characters one and all, had ever seen in him. It certainly wasn't his leadership or strategic skills. This all crystallizes around the tempestuous love affair between Lenk and Kataria the shict. The reasons for them not to be together seem nigh insurmountable, since she could hardly do worse. Not, all in all, an ideal couple around which to hang the courageous, persecution-defying idea of interracial (or in this case interspecial) union. The thing that threatens to drive them apart is Lenk's insistence he wants to stop killing and settle down among other humans—many of whom openly despise shicts. But of course he's all surprised when she's upset. Good one, Lenk. Despite the frustration having so icky a protagonist is bound to cause, The City Stained Red is well worth your time. I just can't help wishing it had been told entirely (or at least mostly; Sykes employs a multi-perspectival narrative that, nonetheless, grants far too much time to Lenk the Unlikeable) from the indomitable Gariath's perspective, and Lenk, if he'd appeared at all, had only added his blood to that staining the city. This review brought to you by Zhaoyun, sci-fi/fantasy-lover and dreamer of dreams here at NOAF since practically forever ago (actually 2013).